I hesitated a bit whether to take my family to the center of Australia, so-called Outback. 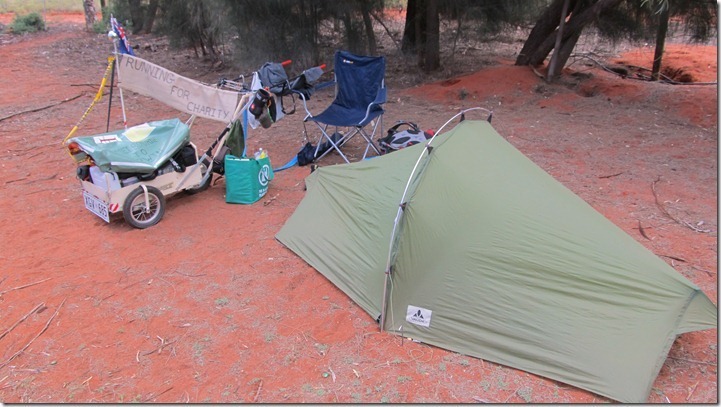 A few years ago I made a big loop around OZ visiting among others Uluru and Alice Springs. Though Outback has a lot to offer you must be ready to travel thousands of kilometers. 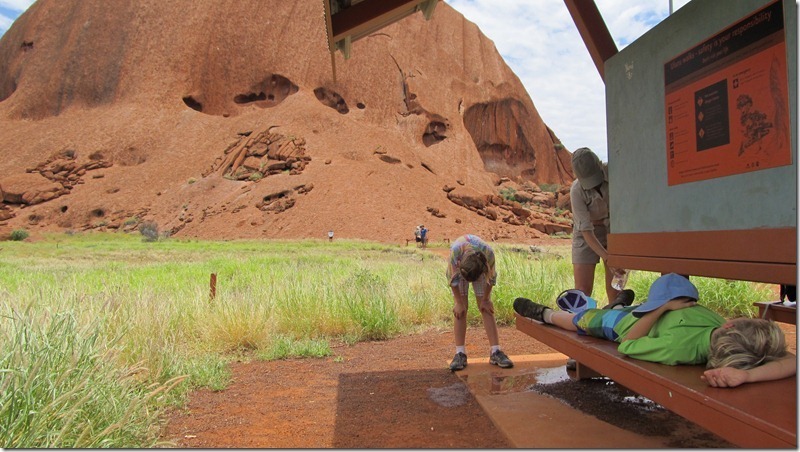 Our first day in Ayers Rock (Uluru) proved it was worth the effort. 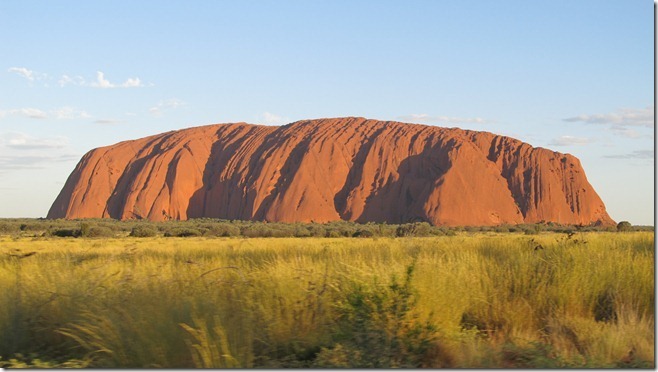 Visiting the famous sacred mountain of Uluru takes a lot of determination. Not only is it located thousands of kilometers away from big cities but also around 500 km from the nearest city of Alice Springs. Uluru is well-known from many photographs. The mountain itself is about 350 m high. The walk around it is about 10,6 km long. That is how you are advised to explore, rather than climbing it. Obviously there are some people not heeding the pleas of the Aborigines not to walk on it. Our hike around Uluru took us about 3 hours including breaks. We were lucky it was only … 38 C, and not 44 C like two days earlier. Ania, who has a unique ability to pick up good vibes was thrilled to feel the golden energy of Uluru. It is no wonder why this is a sacred places for the Aborigines. There a few theories how Uluru came about. The most unreal says it came as a huge meteorite from the outer space. Geologically speaking it is a so-called bornhardt, i.e. a kind of weather-resistant rock that withstood the erosion while everything around ended up flat. Its reddish color, less red in reality than in pictures, suggests high iron content. Somewhere half way on our walk around this magic mountain we suddenly heard some noisy bunch of people getting closer to us. It turned out to be a sizeable group of Aboriginal boys of different ages running in the street and playing a ball and doing some acrobatic stunts. When I asked them where they were headed they said they were going to swim in a waterhole. After a small conversation they all continued their lively march in the scorching heat doing a few stunts for us. We were all fascinated by this encounter. It is not easy to establish contact with the Aborigines. According to the chronicles when captain Cook was discovering Australia by entering Botany Bay in 1770, Aboriginal people working nearby were not particularly impressed seeing big ships entering the bay. After a quick look they returned to their work. Today the indigenous people of Australia seem also unapproachable. From our conversations with some white people living closer to the Aborigines we learned that they are quite shy. Reading about this interesting and one of the oldest cultures I was struck by one quote in particular by Daisy Bates in The Passing of Aborigines, “The Australian native can withstand all the reverses of nature, fiendish droughts and sweeping floods, horrors of thirst and enforced starvation-but he cannot withstand civilization. Its still sounds so true today and unfortunately is not a good refernce for the modern civilization. For many years the policy of white settlers in Australia toward the Aborigines was extremely cruel. Persecutions, abuse and even pleasure hunting for Aborigines were not only common but tolerated by the law. Needless to say, the indigenous people for years had no rights. Another appalling cruelty was forceful taking of children from their parents and sending them to special orphanages. It was believed that such a state adoption was good for the parents and their children. Those of you who saw the movie Australia, get a sense of what I am referring to. The white people are also responsible for spreading alcoholism among the Aborigines. All told, in this highly successful and egalitarian Australian society the topic of the Aborigines is embarrassing. Fortunately, today Australia has changed completely its approach toward the Aboriginal minority, giving them back a lot of land and providing generous welfare. The latter one can be demoralizing, though, in many cases. To commemorate the years of oppression against the local people the “National Sorry Day” has been established and is observed on May 26. 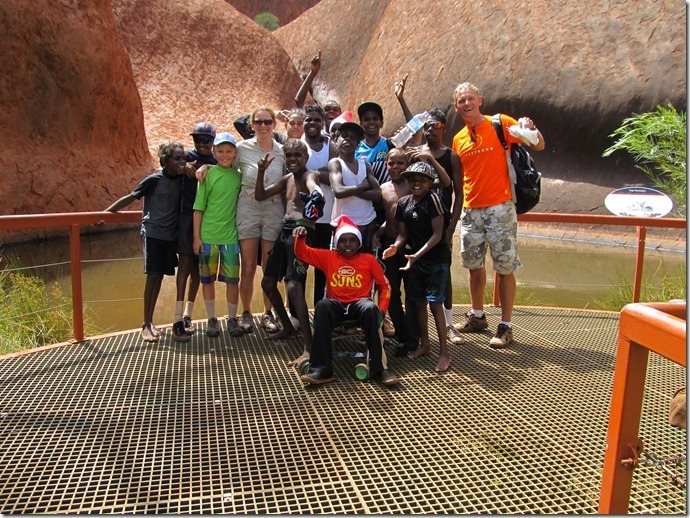 To our great joy, continuing our walk around Uluru we came across the same group of Aboriginal boys. 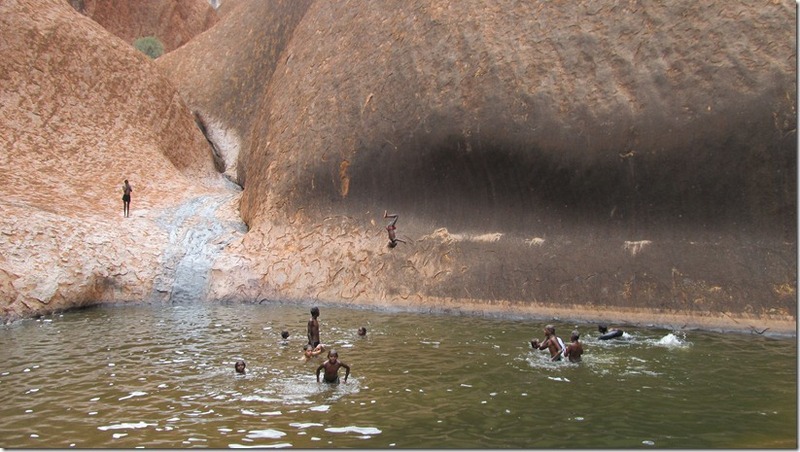 This time they were swimming in a sacred waterhole called Mutitjulu. It was a breathtaking view. The boys, seeing us, started performing some acrobatic water jumps off the vertical walls around the pool. When they got two Christmas hats from us as a souvenir it was nice to watch how they all enjoyed the present rather than fight whose it is going to be. The closer you get to Uluru, the more diverse it looks. There are plenty of crevices and Swiss-cheese-like holes. Some of them relate to interesting legends like the one about a Kuniya, a woman python and Liru, a poisonous snake. After killing Kuniya’s nephew by Liru revenge is taken by Kuniya and the rocks to this day bear the signs of that battle. After a few days of driving we ended our trip through the outback in Darwin in the north of Australia. Driving 2200 km from Uluru to Darwin and during my morning runs across Australia I kept thinking about Remi’s incredible feat. Unfortunately, the more we moved north the hotter and more humid it got. The Australian summer is on. On the way to Darwin we visited a couple more places such as Devils Marbles with Uluru like yet much smaller round rocks and Daly Waters, with the first pub and first international airport (a dirt airstrip in the middle of nowhere) in Australia. 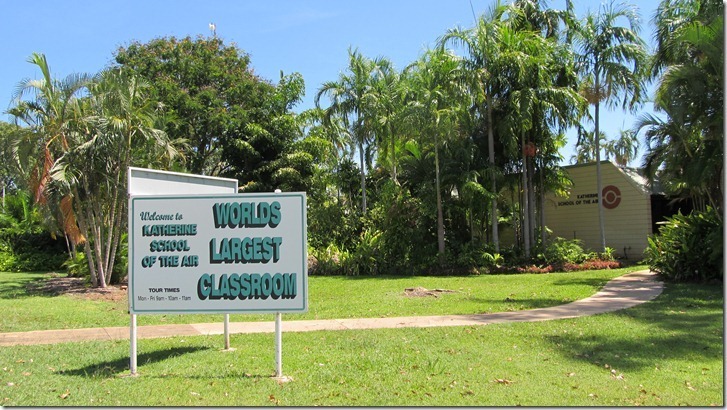 In Katherine we pitched a tent near The School of the Air, one of the regional centers for, as it calls itself, the world’s greatest classroom. This unique school delivers distant education through radio and internet to students in scattered in remote locations around Australia. While in Katherine we learned that the main road connecting Outback with Darwin, Stewart Highway, was still closed two days earlier because of river flooding following a cyclone. We were thanking God again for sparing us any cataclysms. Just before Darwin we made a two-day camping in Litchfield National Park. Though we initially planned to go to Kakadu NP, Litchfield did not disappoint us at all. In its beautiful and wild scenery of pristine waterfalls, crocodiles and waterholes we welcomed 2012. It is there where we also spent our last night in a tent during our sabbatical. It turned out to be quite tempestuous. Just before midnight there came a strong wind and thunder. Expecting the worst we folded our tent and got in the car to wait this out. Sleeping in a car on a muggy night did not sound appealing. We all enjoyed the Outback and highly recommend visiting central Australia. Though it seems empty in fact it is so full of life, as best evidence by countless termite mounds along the way. Ten wpis został opublikowany w kategorii Australia, English i oznaczony tagami Cooltura, natura, Trivia. Dodaj zakładkę do bezpośredniego odnośnika. You should be a part of a contest for one of the most useeful websites on the internet.